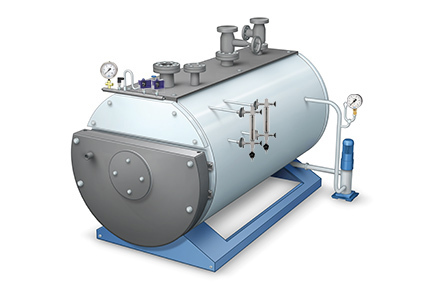 Industrial steam or hot-water boiler systems are used in the food industry, in hospitals, in the automotive industry and many other areas. A whole series of components work hand in hand: for example boilers, economisers, oil pressure control, water treatment, return flow temperature safeguard and others. The goal is the efficient provision of energy in the form of hot water or steam. As a manufacturer of modules for industrial plants of this magnitude, you know how important it is to be able to rely on every single component, one hundred percent. As a supplier of safety-relevant measuring and switching instruments, we understand this responsibility. That is why WIKA focuses on the reliability and accuracy of the measuring instruments, as well as a high delivery performance. The graphic indicates, representative for the different components of a boiler system, the most important measuring instruments and switches on a steam boiler. These include a sight glass level indicator, which is a mandatory part of a steam boiler through DIN EN 12953-6. Further information can be found in our flyer.